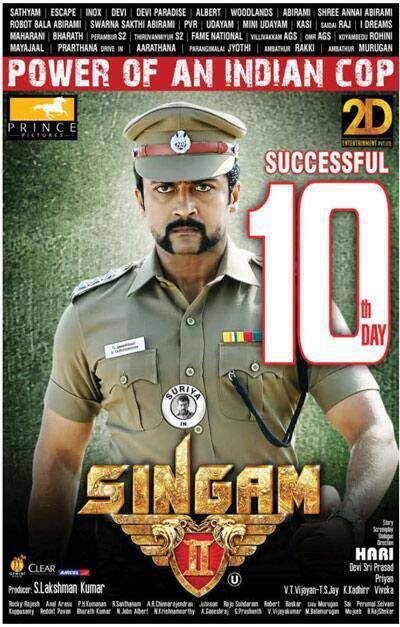 First of all how many of you watched Singam2 movie… Do you gone for FDFS (First Day First Show). The reservation was a Big Success which led to houseful boards before first show itself, so many fans, who are waiting to see surya in Singam2 on first day first show are greatly disappointed because there were no tickets available in theatres. The film released in single as well as multiplex theatres and got shattering response from the crowd. The film released in about 2400 theatres which is a record in Kollywood (Tamil) industry beating Endhiran, and 151 theatres in Kerala alone (151 theatres Oh My God!!!). In all major releasing towns in Kerala, the film released in 3 to 4 theatres which are not even done by any Malayalam cinema, the response also great from everyone, and the box-office reports are amazing. Most of the time, Even Malayalam cinema superstars couldn’t get these shattering response from their audience, but Singam2 made it ..
Singam2 is the first sequel film in Tamil Industry, it starts where Singam part 1 ends. Director shows some necessary clips from “Singam” at the start of the film “Singam2”. The film starts with the opening mass song “Vaale Vaale” and Surya appears suddenly without any mass introductions. The intro was so simple unlike “Singam”. As usual, Director Hari shows his name with the picture of temple in the background. The “Vaale Vaale” Song was beautiful in which Anjali plays an item dance. Onwards from this song director Hari reveals a continuation from the Singam part1 movie, in which he is officially resigned and charging as a detective in Thoothukudi harbor. In Singam2, Surya is an NCC Master in a school in which Hansika plays an important role as a Plus Two (+2) student. Anushka really have not big part of the movie but she comes and romances with Surya every time on the screen. It’s amazing that Anushka and Surya’s chemistry are extraordinary and keeps the audience to have Anushka in the film. 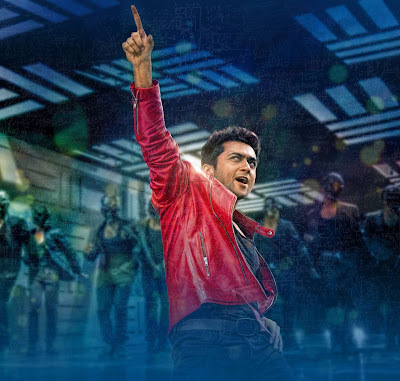 The song “Kannukkulle” well choreographed and the moves and expressions of the actor surya and actress anushka is too good, and cannot ignore for the audience. And the song “Let’s Singam Dance” is amazing to see on the screen and the dance moves are great to see from both of Surya and Anushka. In all of these, we can surely say that these two are awesome pair with amazing chemistry. Anushka is charming and more intelligent in Singam2. Also she is more responsible than previous Singam. Surya is the one who carries the whole story from his intro to the end. Suriya all the way... It was amazing that he working hard like this, and that was reflected in every shot of the film. Everything from dance to Fight he is just like a king. He really deserves a big respect and love for his worthy performance. He is just moving in the screen all around like Singam, without losing a bit of energy. His dialogue deliveries are at the best without any disappointment you can saw this movie just for his mighty performance. The story is well packed with every aspect. It’s a complete entertainer with Action, Mass, Class, Intelligence, Dance, Sentiments, Brain Teaser, Romance, Songs, Stunt, Race and performance. Singam2 is a strong story, which is paced with Director Hari’s racy screenplay. The film is long and strong with running time: 2 hours And 47 Minutes, but we never get bored. The mass action sequence just satisfies all the fans and the performance, Class satisfies each one who likes to see cinema. The stunt sequences as usual great to watch from Hari, and the typical class of Hari greatly influenced the audience. The actors Vivek and Santhanam just laugh us immediately whenever they appear on the screen. They are really a plus (+) point to the film and greatly entertain the world. As this Film Include in Mass Category Movie the film rating is: 4.3/5. This is your time now..... .. Watch And Enjoy.. Plz. Give your Feedback also..
We need Likes to get you updated please like and support Also share this page and blog to your friends. You can Also Read This Review in your language (You Need Computer). Just use Our Google Translator at the right bottom of this Page. Is it good Or Not ?? ?